This Nikon 5x 15 Monocular model may be tiny, but it delivers what it promises: super sharp and bright images from a far distance. Nature can be our greatest entertainer if we’re willing to pay attention. From rolling thunderstorms lighting up the sky to dolphins at play in the ocean – if we were to put down our phones for long enough to consciously breathe in our surroundings, we could become witness to some of nature’s most beautiful spectacles and they are guaranteed to benefit you more than an episode of Games of Thrones ever could. If you’d like to open your eyes to all the breath-taking, natural scenarios that will fill you with gratitude and awe, we recommend you use the Nikon 5 x 15 Monocular HG5X15D to assure you’ll never miss an opportunity for bird-spotting again. 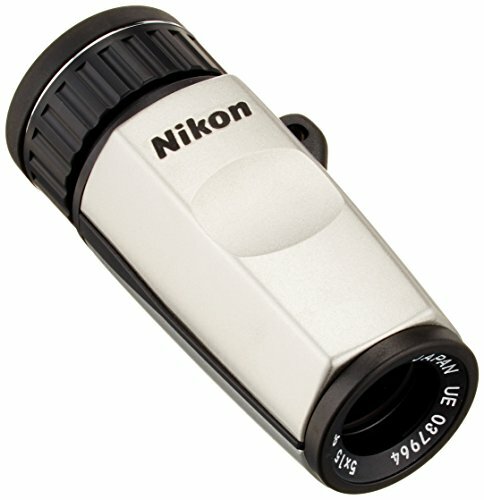 If you have finally decided to take the step towards swapping your mobile phone and TV for the greatest show of all – namely, nature – you can’t go wrong with this Nikon monocular: it will allow you to view all the most awe-inspiring moments in life and the wilderness clearly, sharply and from a distance. At just 4.2 x 2.5 x 1.9 inches, it is the perfect gadget you can always carry with you comfortably, either in your pocket or hung around your neck for easy and quick access. Though it does not feature an optical zoom, it offers up to 5x magnification at a 1000-yard distance, with a 472-foot-field view. Delivered in a leatherette protective case with Velcro closure for speedy access, this scope can be used in all types of weathers and environments, though it is recommended not to use them in extreme conditions. However, this product is very resistant to mold and fog, hence sailors and ocean enthusiasts are quick to recommend it as the ideal tool for looking beyond the horizon. Its length of vision is equivalent to the length of a standard football field, in other words, the perfect little helper for parents who don’t want to miss any important details while they’re cheering on their kiddos during important games. Made in Japan, this scope’s high-eyepoint design with a close-focusing distance of 0.6m and phase-correction-coated prisms for high-resolution images has proven extremely popular among those looking to get a sharp look at the constantly evolving world around them. The multilayer-coated lenses are durable and offer great eye- relief (15.8mm) and a 9˚ true field of vision that will allow you to read the small-print on advertising posters from a hundred-foot distance and can be cleaned with a dry lens cloth. It’s small size and minimal weight make this scope extremely functional and easy to carry around. Keep it safely tucked in its leatherette protective case and pack it in your suitcase or hiking backpack without having to worry about damage – the case is padded and designed to offer it optimal protection, keeping both indoor and outdoor use in mind. It is the ideal size for pocketing or hanging around your neck with sturdy strings, allowing you to have it at reach whenever quick reactions are needed: nature will not wait around for you to find your perfect timing and, fortunately, with the this monocular, you’ll always be in time to magnify your field of vision and see wild-life displays play out right before your eyes without unnecessary squinting and a clear, detailed vision. Regardless of the environment you are using this monocular in – be it in bright sunlight or under artificial light – the image is incredibly bright and the optics amazing, considering it has such a small objective lens. With a close focus of around 22 inches, the Nikon 5×15 Monocular can be used for multiple indoor and outdoor purposes – as opera glasses or to view intricate artwork in dim-lighted spaces, for bird or whale spotting or a simple, meditative study of distant landscapes. Recommended Next: Don’t miss our guide to the very best monoculars on the market. With its stainless steel housing, this model is sturdy yet light-weight, allowing you to keep an even hold on it without tiring your arm. While it is not advertised as waterproof – users are advised to keep it out of the rain and protected from other natural elements such as sand and mud – its compact size allows for a lot of creativity, making it attractive for bird spotters and other nature enthusiasts who may choose to cover it with a plastic bag or something similar during unfortunate weather situations. Featuring an internal focusing system, the user will see the ocular lens move as it adjusts its focus. While the Nikon 5 x 15 Monocular initially takes a bit of extra power to move into position, it ultimately adjusts smoothly. The chromatic aberration is minimal, with only a small hint of a blur visible between colors. Made of top quality and coming with a 25-year no-fault warranty, this gadget will make for a great purchase that will not end in buyer’s remorse. The Nikon molecular comes highly recommended by people who truly know their stuff: those who spend every free second hiking through mountains and forests, crossing seas and trekking through the jungles of the world in search of nature’s greatest kept secrets. The ones we miss when we’re too busy trying to get a sturdy hold on our weighty binoculars; the ones that play out while we’re trying to adjust the focus on a poorly design monocular. 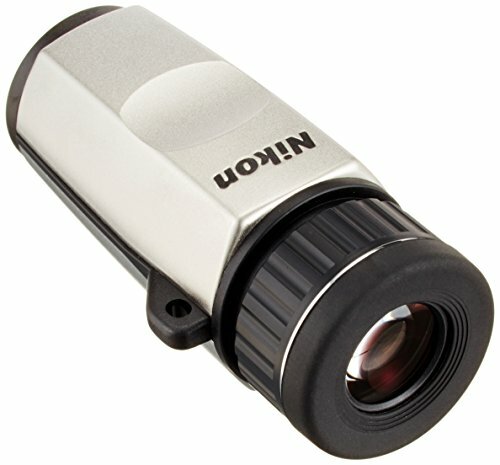 The Nikon monocular may be tiny, but it delivers what it promises: super sharp and bright images from a far distance. It fits comfortably into the user’s hand and, at only 2.72 ounces, it is light and easy to operate without tiring out your arm. At less than $200, it makes for an economical buy that is guaranteed to be long-lasting. This is a great purchase for anyone wanting to deepen their connection with nature and experience unforgettable moments up-close – or at least, feel as though they are part of the scene when, really, they are watching on from a safe distance that will not disturb your subjects and their fascinating narratives.